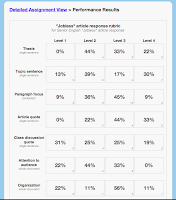 : Latest Update: Rubric aggregate performance data! I've been promising this one from the start! 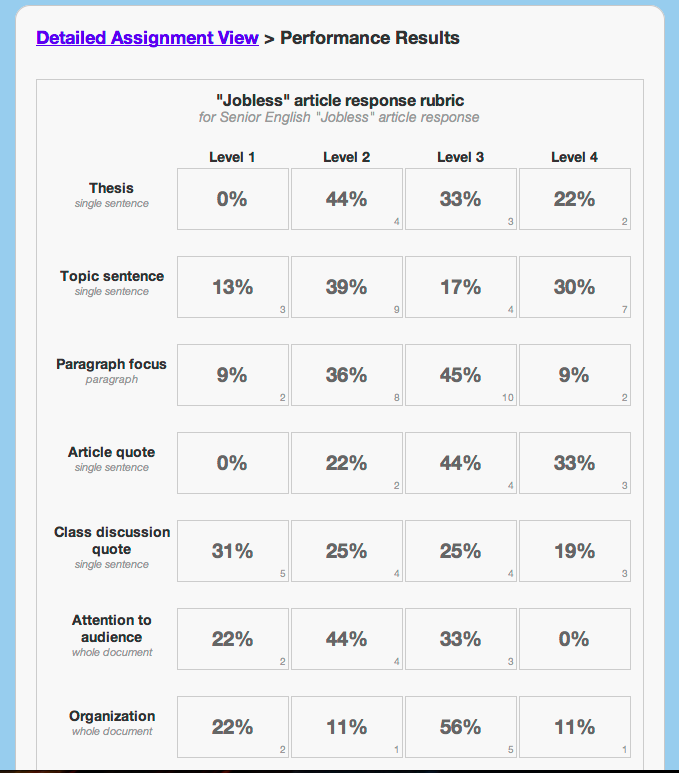 You can now see how your class as a whole performed on a particular assignment! Each grid position tells you the incidence rates of each rubric element over the possible quality levels. The tiny number in the bottom right is the actual number of comments that counted towards the total from that grid position. It's such a simple calculation for the database to do that I was able to write it in one straightforward request. This is the power of databases!! Yay!! I've also experimented with adding some color coding. In the version that's now on the website (but not pictured here) the grid cell with the highest percentage is outlined in its quality level's associated color - green for best, red for worst, yellow for in-between. We'll see if folks find the color border useful or not. And this is just the beginning. We can pull so much more out of the database! Just tell me what you want to see!